A month ago, I participated in Ludum Dare, a 48-hour game development contest. This was the first time I finished a game-like project since about 2005. The theme of the contest was "connected worlds". I made a game called Quantum Dash that experiments with parallel universes as a central game mechanic. 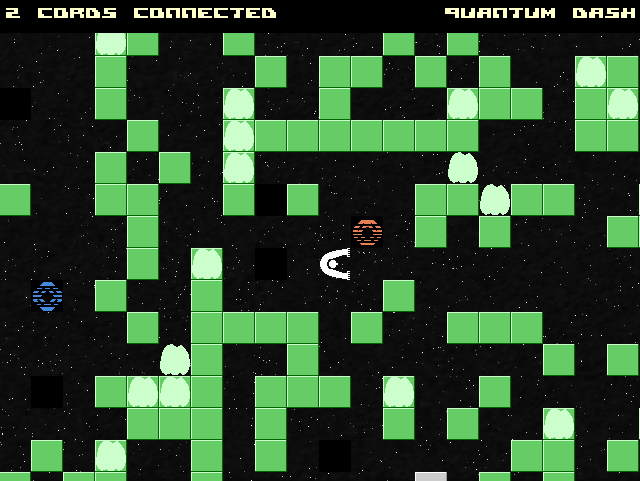 The player operates in three universes at the same time, and when connecting "interdimensional cords", the differences between these universes explosively cancel each other. The "Dash" part in the name refers to the Boulder Dash style grid physics I used. I found the creation process very refreshing, I am quite happy with the result considering the circumstances, and I will very likely continue making games (or at least rapid prototypes thereof). My relationship with computer games became somewhat dissonant during the nineties. At that time, the commercial industry became radically more centralized and profit-oriented. Eccentric European coder-auteur-heroes disappeared from computer magazines, giving way to American industry giants and their campaigns. There was also the rise of the "gamer" subculture that I considered rather repulsive from early on due to its glorification of hardware upgrades and disinterest towards real computer skills. Profit maximization in the so-called serious game industry is largely driven by a specific, Hollywood-style "bigger is better" approach to audiovisual esthetics. That is, a strive for photorealism. This approach is, of course, very appealing to shareholders: It is easy to imagine the grail -- everyone knows what the real world looks like -- but no one will ever reach it despite getting closer all the time. Increases in processing power and development budgets quite predictably map to increases in photorealism. There is also inherent obsolescence: yesterday's near-photorealism looks bad compared to today's near-photorealism, so it is easy to make consumers desire revamped versions of earlier titles instead of anything new. In the early noughties, the cult of photorealism was still so dominant that even non-commercial and small-scale game productions followed it. Thus, independent games often looked like inadequate, "poor man's" versions of AAA games. But the cult was starting to lose its grip: independent games were already looking for new paths. In his spring 2014 paper, game researcher Jesper Juul gives 2005 as an important year in this respect: since 2005, the Grand Prize winners of the Independent Games Festival have invariably followed styles that diverge from the industrial mainstream. Juul defines "Independent Style" as follows: "Independent Style is a representation of a representation. It uses contemporary technology to emulate low-tech and usually “cheap” graphical materials and visual styles, signaling that a game with this style is more immediate, authentic and honest than are big-budget titles with high-end 3-dimensional graphics." The most prominent genre within I.S. is what Juul calls "pixel style", reminiscent of older video game technology and also overlapping with the concept of "Computationally Minimal Art" I formulated a few years ago. My game, Quantum Dash, also fits in this substyle. I found the stylistic approach appealing because it is quick and easy to implement from scratch in a limited time. Part of this easiness stems from the fact that CMA is native to the basic fabric of digital electronic computers. Another attracting aspect is the long tradition of low-tech video games which makes it easy to reflect prior work and use the established esthetic language. Another widely used approach simulates art made with physical materials such as cut-out paper (And Yet It Moves) or wax pastels on paper (Crayon Physics). Both this approach and the aforementioned pixel style apparently refer to older technologies, which makes it tempting to generalize the idea of past references to other genres of I.S. as well. However, I think Juul somewhat stumbles with this attempt with styles that don't have a real historical predecessor: "The pixel style 3d games Minecraft and Fez also cannot refer to an earlier time when 3d games were commonly made out of large volumetric pixels (voxels), so like Crayon Physics Deluxe, the historical reference is somewhat counterfactual, but still suggests a simpler, if nonexistent, earlier technology." I think it would be more fruitful to concentrate on complexity than history when analyzing Independent Style. The esthetic possibility space of modern computing is mind-bogglingly large. It is easy to get lost in all the available potential complexity. However, by introducing constraints and stylistic choices that dramatically reduce the complexity, it is easier even for a solo artist to explore and grasp the space. The contraints and choices don't need to refer to any kind of history -- real or counterfactual -- to be effective. The voxel style in Minecraft can still be considered somewhat historical -- a 3D expansion of grid-based 2D games such as Boulder Dash. However, I suspect that the esthetic experimentation in independent games will eventually lead to a much wider variety of styles and constraints -- including a bunch that cannot be explained with historical references. The demoscene has been experimenting with different visual styles for a long time. Even at times when technical innovation was the primary concern, the goal was to find new things that just look good -- and realism was just one possible way of looking good. In 1996, when realtime raytracing was a hot new photorealistic thing among democoders, there was a production called Paper by Psychic Link that dropped jaws with its paper-inspired visuals -- a decade before paper simulation became trendy in the independent games scene. Now that the new PC hardware no longer challenges the demo artist the way it used to, there is much more emphasis on stylistic experimentation in non-constrained PC demos. Because of this longer history of active experimentation, I think it would be useful for many more independent game developers to look for stylistic inspiration in demoscene works. Of course, not all the tricks and effects adapt well to games, but the technological and social conditions in their production are quite similar to those in low-budget games. After all, demos are real-time-rendering computer programs produced by small groups without budgets, usually over relatively short time periods, so there's very little room for "big-budget practices" there. Here's a short list of demos with unique esthetic elements that might be able to inspire game esthetics as well. Two of them are for 8-bit computers and the rest for (semi-)modern PCs. I'm expanding into game design and development primarily because I want to experiment with the power of interactivity, especially in relation to some of my greater-than-life goals. So, audiovisuals will be a secondary concern. Still, due to my background, I want to take effort in choosing a set of simple and lightweight esthetic approaches to be used. They will definitely be computationally minimal, but I want to choose some fresh techniques in order to contrast favorably against the square-pixel style that is already quite mainstream in independent games. But that'll be a topic for another post. financially minded retirement age folks looking for a low yard maintenance, community activity oriented formula 41 extreme. does formula extreme 41 really work? These all are possible with the help of love formula extreme 41. Like they say: "Talk is cheap. Show me the code."